When it comes to recent developments in Turkey, sometimes you have to laugh to keep from crying. One of the best at finding the humour in what would otherwise make you weep is Cem Dinlenmiş, the artist and cartoonist whose weekly ‘Anything Goes’ (‘Her Şey Olur’) column in Penguen pointedly captures the absurdities that punctuate life in this country. His most recent solo show at x-ist, You’ll Know When You See It, builds on the acerbic snapshots in his weekly column to tell a more complete story. By chronicling the exploits of a fictional company, Akarca Construction, in Esenyurt, an actual district of Istanbul, Dinlenmiş comments on Turkey’s modernisation adventure as seen in the changing urban, political and cultural landscape of this one particular area. 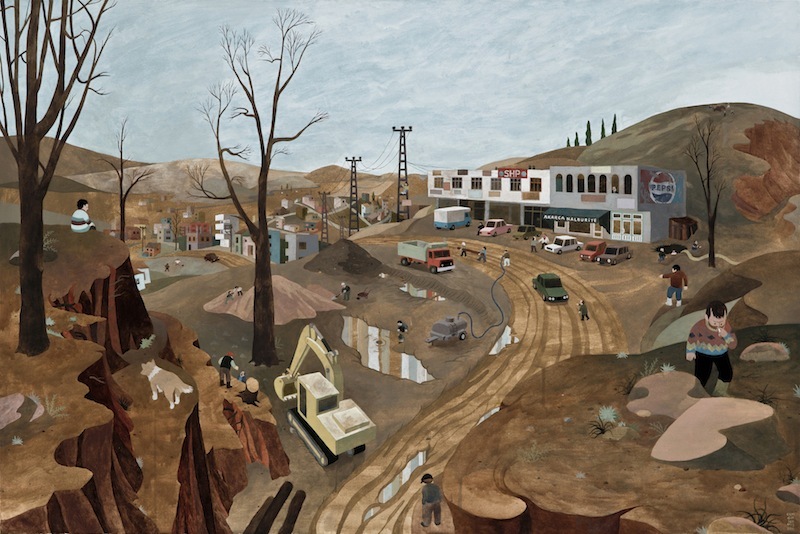 His works are both biting and accessible – the simplicity of his rounded figures, whose facial expressions are little more than a few lines and dots, belies their depth, and the larger landscape they occupy is chock-full of humorous – if sadly accurate – details. Dinlenmiş recently spoke to us about the inspiration behind this compact exhibition, which runs until Saturday, February 27. In your exhibition You’ll Know When You See It, you take an inventive spin on reality by documenting the exploits of a fictional construction company, Akarca Construction, in a non-fictional district of Istanbul, Esenyurt. What made you decide to create an imaginary construction company? Were you concerned about potential backlash if you had documented the actions of a real construction company? Fictional characters have a representational image – a real construction company would not be capable of representing all the characteristics of Akarca Construction Company. I document the actions of actual construction companies in my political cartoons without too much worry about backlash. However, in the exhibition I needed an actor that could easily connect different scenarios. 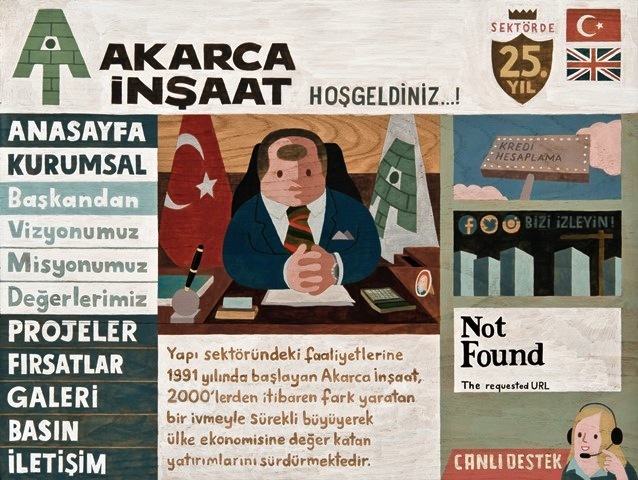 You note in the panel about Akarca Construction, that ‘As a friend of the arts, Akarca Construction supports many contemporary art projects and exhibitions.’ Do you think that corporations have too much sway in the Turkish art world? Do you feel this corporate influence has created an environment of self-censorship? By adding art sponsorship to this imaginary company’s profile, I was trying to imply that we’re not talking about a small local firm here. It’s obvious that corporations play an important role in today’s global capitalist art markets – investing in contemporary art, sponsoring museums, galleries and biennials to gain social legitimacy. I can say this leads not only to self-censorship but also to direct censorship in many cases. 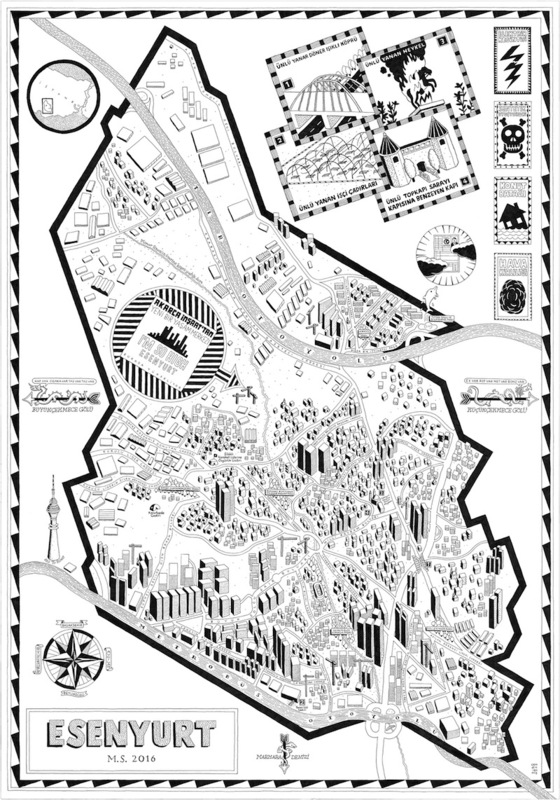 One of the most compelling pieces in your exhibition is the map of Esenyurt, which pokes fun at recent urban development. What inspired you when drawing this map? 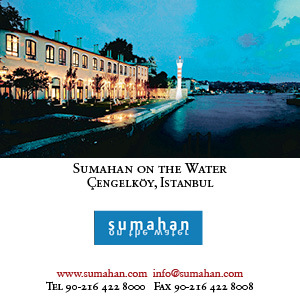 The map of Esenyurt is somewhere between my cartoons in Penguen Magazine and the paintings displayed in my exhibitions. I was trying to apply the ironic storytelling I use every week [in Penguen] to a couple of works in order to connect the paintings with my more humorous pieces. Although Esenyurt is well known for being historically aligned with the CHP (Republican People’s Party), the victory of the AKP (Justice and Development Party) in 2004’s local elections began to wipe out traces of the former era in the district. You can notice the social and political contrast when you look at the names of the parks, streets and boulevards. The spatial effects of social and economic change are noteworthy in the area, so I found that documenting the process through a map was useful. 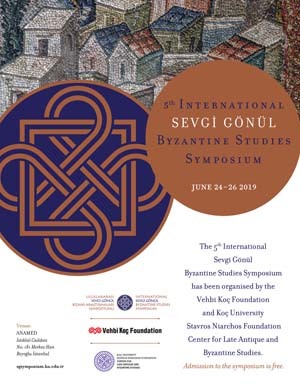 The major pieces in the exhibition, like ‘Soldiers Deployed in Esenyurt’ and ‘Life in Tozkoparan’, provide the ‘big picture’ of Istanbul neighbourhoods. 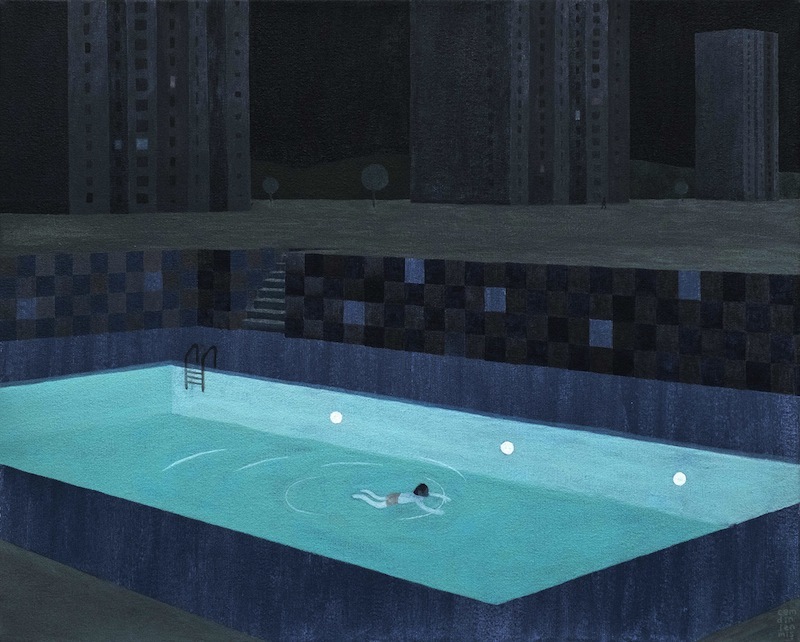 Other works provide a narrower focus, such as a man swimming alone in the pool between new apartment buildings. Why did you want to include these more focused pieces? In the exhibition you can see the painting of a website, the painting of a district and the map of a district, all of which look at the same subject from a different scale. In a couple of works I tried to create compositions that focus on the details of a larger landscape. Changing the scale helps me visually piece the story together. Looking back, I think I could have also included a short comic story, which is something I might work on in the future. ‘You’ll Know When You See It’ runs until February 27. Dinlenmiş’s work also appears at ‘Istanbul: Passion, Fury, Joy’ at MAXXI in Rome, which runs until April 30.